The CCT on the rear cylinder looks just like the manual tensioners I see online. Cool. However, the front cylinder...well, someone sealed the two bolt holes with epoxy (or something) as well as sealing (with the same stuff) the hole through which the tensioner bolt (on the manual tensioner) runs. My understanding is that auto-tensioners are 'bullet' looking things, and manual-tensioners have a long bolt that sticks out an inch or so, with a lock-nut on the bolt. To not have either, the 'bullet/auto' or the 'manual' tensioner is a condition I've not been able to find any information regarding. WTF? I'm looking for education, and to try to figure out what's been done to the front cylinder. The bike runs like a champ. Going on 22K miles. Last edited by AlanS; 04-29-2017 at 08:20 PM. 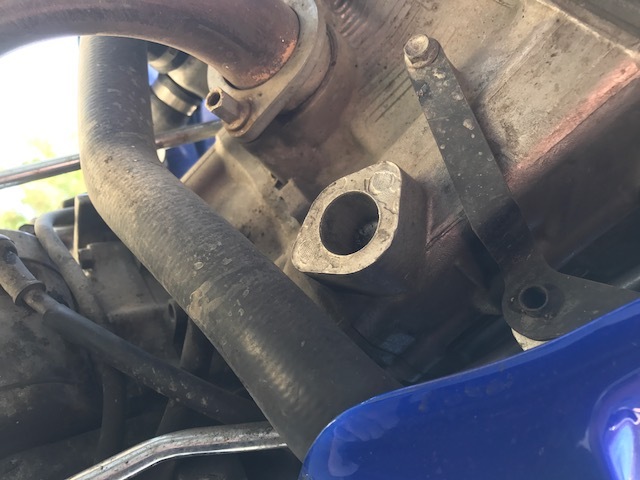 While the rear cam tensioner can be seen on the right side of the bike, make sure you are looking and the left side of the bike, under the fuel tank and directly behind the radiator hose for the front cylinder cam tensioner. Both cylinders also have castings that look like a tensioner may go there but, in fact, it is just a casting. If this is the case, can you post a pic of it? stejm629, here's two pics. These were taken on the left side of the bike (sidestand side), looking up at the bottom of the front cylinder. Yeah that is a casting only. Your cam chain tensioner will be directly on the opposite side of that front cylinder (intake side) also it's kinda hard to see. Cam chain tensioners always sit on the back side of the cylinders on engines that rotate in the same direction as the wheel, as the front side is the straight/tight chain run from the crank to the first sprocket to keep the timing correct. The VTR cylinder casting is the same front and back, but they are finished off differently to account for the rotated orientation (so the intakes are in the V, the exhausts are outside). That means they start with blank castings for a tensioner mount on both sides of the cylinder, but only one side is finished to allow the tensioner to be installed. Apparently you can make a rear cylinder/head work as a front cylinder/head, provided you can open out the unused tensioner mount on the back cylinder and blank off the existing one. Doh! LOL. Yep, found it. Not where I expected it to be. Thanks both of you for your help. So are they in fact manuals? Wolverine, they are 'manual' CCTs. They're red anodized. That's good to hear. One major issue sorted, only big one left is the r/r? The two upgrade specifics I asked the prior owner about were the tensioners and R/R. He said both had been addressed. I ordered my manual CCT's yesterday. I ordered a brand called Black Path.. anyone have an opinion on them? I figure as long as there's a bolt and lock nut they should work fine. I'm sure no expert. But they're mechanically pretty basic things. I think the ones you ordered should work fine as any others.